I’m Jessica, and I have a love / hate relationship with red eye flights. On the one hand, overnight flights are the most efficient way to travel, since you don’t sacrifice any actual days when you’d rather be doing something else. And the type A in me loves efficiency. But on the other hand, I tend to have a hard time sleeping on planes, so I usually end up arriving completely groggy and in need of a long nap – which sort of defeats the point of saving a day. Even though sleep and red eye flights don’t seem to mix well for me, I do have one thing down to a science: my red-eye flight outfit. 2. Be prepared for a plane that’s freezing cold or nauseatingly hot. 3. Be able to wear it again on your trip. 4. Be better than pajamas. Black stretchy bottoms: Depending on the trip, I like to wear either stretchy black skinny jeans (these are my current favorites) or full-length yoga bottoms (like these). The keys here are elasticity and fabric. You don’t need a waistband cutting into your skin, and comfortable pants make sleeping easier. Right? On the flip side, fitted black pants can still be a foundation for a polished look during the trip and yoga leggings double as workout gear. Related: Check out my Best Packing Tips for Women for more help in packing light! Slip-on Shoes: Somewhat obvious, but I always wear shoes that can go on and off easily. It’s hard to bend over in airplane seats (maybe that’s just me?) so laces are outta the question. I usually go for a black ballet flat (check out Tieks) or black flat ankle boots like these. Both are versatile enough to go with a ton of outfits. Cozy Socks: A must. I can pretty much promise you that even if you’re sweating on the plane, your feet are probably freezing, so cozy socks are key. And I’m not talking just socks like you would wear to the gym – those won’t cut it. Try wool and make sure they’re long! In addition to keeping your feet warm, socks will also put a layer between you and a gross airplane floor which is always a good thing. Something like these should do the trick. I’ve also brought legwarmers with me before and they are an awesome addition to a carry on bag! I know – the 80’s called and wants them back, but bear with me. They take up virtually no space, keep you SO WARM and are easy to take on and off. 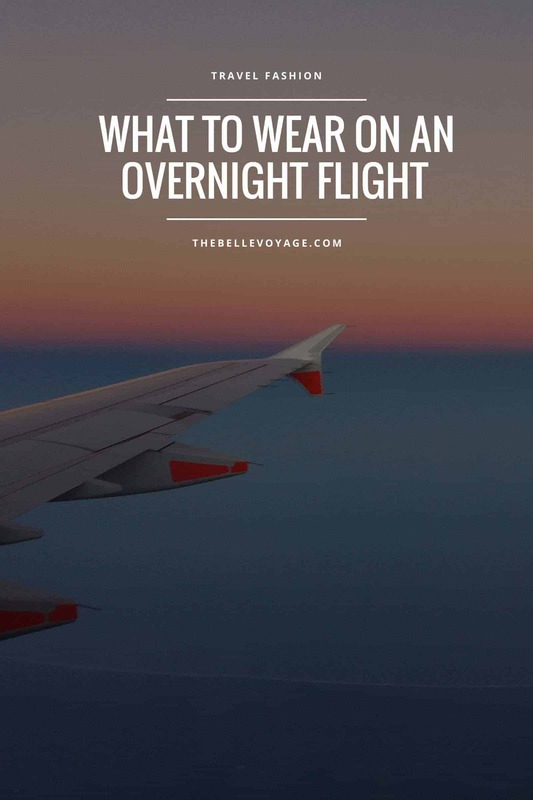 Lotsa Long Layers: Any travel article will tell you to dress in layers for a flight and red eye flights are no different. My suggestion is to make sure your layers are LONG. Clothes get bunched up when you’re shifting around and nobody wants to have skin showing when they’re curled up in a ball trying to get some shut-eye. I like to layer a camisole under a Lululemon long-sleeve tee (shirts in their vitasea fabric are perfect) under a Joie linen t-shirt (you can find them on sale) and top it off with a cozy jacket or sweater. Gigantic Scarf: I look for scarves that are extra-large so that if I don’t need to use it to keep warm, it can double as an extra pillow or cushion. Blanket scarves are everywhere right now and would be a perfect choice! Read more about the anatomy of a perfect long haul flight outfit and how to freshen up after a long haul flight in the airport bathroom. Any other tips for red eye flight outfits? Let me know in the comments!